Mark and Kimberly Sorensen and their daughters, Johannah, Elizabeth, and Olivia, along with 2 part-time and 20 or more seasonal employees. The Sorensen Family delights in growing the "tastiest blueberries around." They love bringing their blueberries to the people who love them just as much as they do. Triple Delight Blueberries, first established in 1996, is located just south of Fresno in California's San Joaquin Valley. Mark & Kimberly Sorensen named their farm after their three delightful daughters: Johannah, Elizabeth and Olivia. 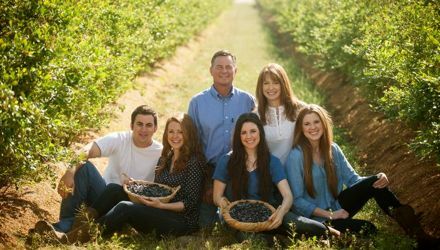 As fifth generation raisin farmers, the Sorensen's decided to plant five acres of blueberries to diversify their farming operation. The initial plan was to sell their berries to a wholesale broker, but in 1998, the Sorensen's tried taking their blueberries to the Aptos Farmers Market on Saturdays. They were quickly drawn to the fulfillment they felt when meeting the people who enjoyed their berries. Each year, their farmers market operation grew, and before long they were able to sell their entire crop directly to the consumers through markets in Central and Northern California. Their short, ten-week season means attending many markets in a short amount of time. Mark & Kim planted ten additional acres in the fall of 2006 in hopes to lengthen their season by planting different varieties. The Sorensen family thoroughly appreciates their loyal customers who wait patiently for the blueberry season to begin each year. They love growing a crop that brings much joy to so many people and look forward to the continued friendships they rekindle each year.